A pioneering arts-based marketplace held every Sunday on the Fairfax High School campus. Antiques, Collectibles, One of a Kind Gifts, Art, Vintage Clothing, Vintage Jewelry and so much more! The Melrose Trading Post offers a constantly evolving experience, with a curated selection of handcrafted artisan goods, eclectic art and craft, vintage fashion, antique furniture and one-of-a-kind treasures. 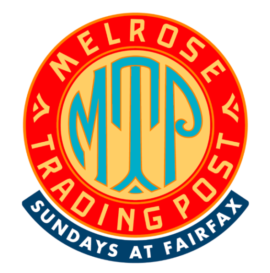 Through admission and vendor fees, the Melrose Trading Post has grown to become the most successful ongoing social enterprise program in the history of Los Angeles Unified School District, awarding grants to Fairfax High School organizations for sports equipment, beautification projects, teacher programs, theatre productions, and more – totaling well over seven million dollars since the Melrose Trading Post’s humble beginnings in 1997. Through Greenway Arts Alliance, the Melrose Trading Post provides formal job and life skills training to large numbers of paid and volunteer students from Fairfax High School – the first real-world job experience for many. The market also serves as an incubator to promote small community businesses and budding entrepreneurs, many of them professional artists, by providing affordable retail opportunities in a prime, high-traffic location. Additionally, the popular weekly market has always featured local musicians. In 2014, the market expanded to include even more opportunities for local artists through an outdoor, year-long series of music, dance, theater and spoken word events via the Greenway Arts Main Stage. The Courtyard’s seating area is a fantastic place to relax on a Sunday afternoon. All entries should be vintage-related and Guide to Vintage reserves the right to only accept those entries that fit the profile of the site. Guide to Vintage is not the organizer of any of these events. This is merely a site to find events around the world. Guide to Vintage cannot take any responsibility for, including but not limited to, openings hours, canceled events, entrance fees, experiences or recommendations, or anything that has to do with any of the events posted on this site as content is user-generated or collected from online resources and is not first hand.